The future direction: where does Malpass stand? How should the World Bank engage with the rise of new creditors and funders in the system – particularly Chinese banks? Without being a “self-service shop” for investors – what is the vision for the Bank’s role vis-a-vis private finance? It’s easy to say don’t privatize health and education sectors, but what about beyond those easy platitudes? What is the role for the IFC that accords with a sensible vision for a multilateral bank that is now supposed to be supporting sustainable development, rather than what an aid agency should do? 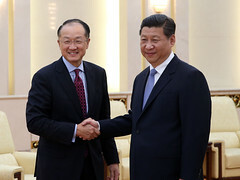 Given worries about debt crises building in developing countries, how should the next World Bank president manage lending to countries increasingly heading towards debt distress but in desperate need of investments to hit their Sustainable Development Goal (SDG) targets? And how should the Bank approach traditional donors who are increasingly shying away from aid amid populist backlashes? How should the World Bank president curry favour without being seen as craven (such as partnering with Ivanka Trump)? Finally, how can that President ensure ambitious national sustainable development strategies are embedded in the Bank priorities at country level while the Bank and their staff have to get money out the door? Can a President make a Bank, owned and beholden to national governments, be community-driven? This entry was posted in Candidates, Take Action, The Process by Old Hand. Bookmark the permalink.